Water features are impressive additions to any yard. 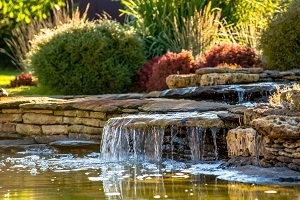 Whether you want to greet clients and customers to your business in style, a private retreat in your backyard, or a feature to show off to your neighbors, an outdoor waterfall is definitely the way to go. However, waterfalls that don't occur naturally require some careful planning and installation in order to work properly. Fail to plan carefully and you'll end up with what looks like a wall of mildew or a very earnest water hose. When you work with hardscaping in Roswell, or hard-material features that incorporate into a landscape, you'll need to craft a careful design scheme. Here are some tips for planning your own outdoor waterfall. Detailed blueprints might not be a necessity, but any hardscape design needs to begin with a thorough plan of what you want the final result to look like, where it should be placed, and what direction it should face. Try to take advantage of natural slopes to allow water to fall naturally, if possible. You should also plan the impact of the final result. Do you want a waterfall that looks straight out of a natural forest or do you want a modern, manmade appearance? Decide on what stones you'll use, the plants to arrange around it, and other hardscape ideas, like nearby benches or a pathway to follow the water. The waterfall needs a good body of water as a source, so clear a sufficient amount of grass and sod to the pre-determined pond dimensions. Mark the maximum dimensions of the pond and determine if you should add natural curvature to the pond. Dig it at least 6 inches deep. Put down a Biofalls filter and a bottom skimmer filter. These filters will determine how the water flows and where the following stream will flow. The bottom filter should be far away from the water source. Use PVC pipes to connect the filters, then excavate to bury the pipe. Once you have dug up the pond, dig 2 deeper levels into which water will flow. There can be about 1 foot between each layer. Then, install underlayment over each filter. There's no need to cut it precisely at this point. Pleat the underlayment to sit flat. Then, install a naturally safe liner over it. You can now place stones or pebbles in the floor of the pond. This keeps the liners in place and gives it a natural appearance. Use a variety of shapes and sizes. You should then be ready to fill the pond and watch water cycle through it. Your next step will be to install other features with the help of landscape and hardscape contractors. If you're unsure if you can do this work yourself, remember that a contractor can easily help you draft a design scheme and implement it on their own. No work will be needed on your end. 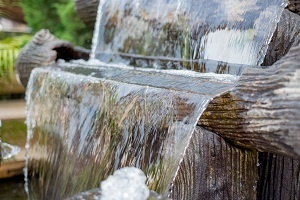 Experts in hardscaping in Roswell are experienced with outdoor waterfalls and other fine features.